SPECPUB-3. Re-instate inheritance from descendants of X_VERSIONED_OBJECT<T> to X_VERSIONED_OBJECT from Release 1.0.2 (lost in original UML conversion). This specification is in the STABLE state. 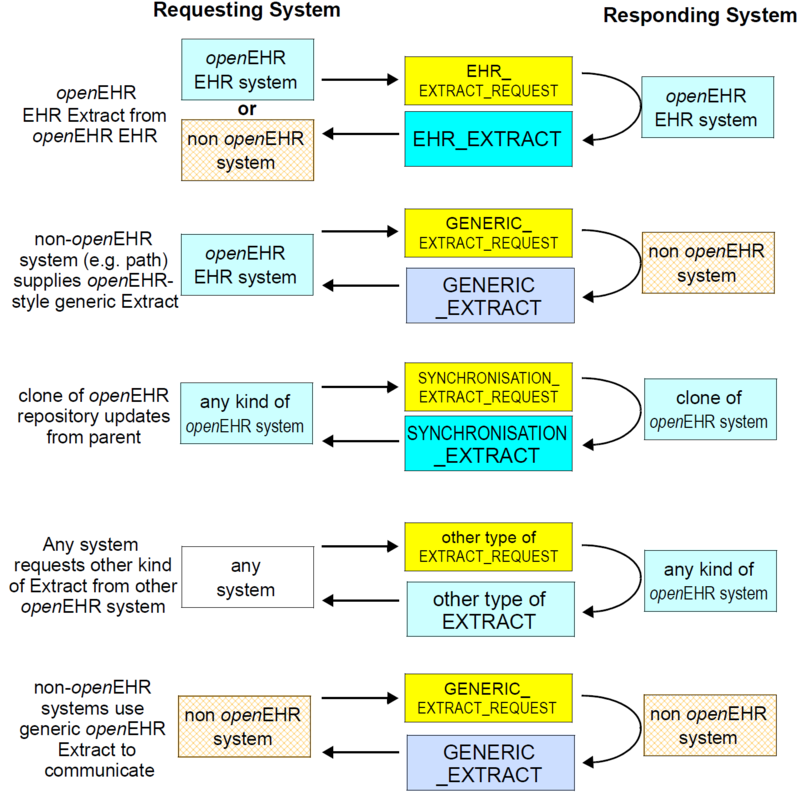 The development version of this document can be found at https://specifications.openehr.org/releases/RM/latest/ehr_extract.html. 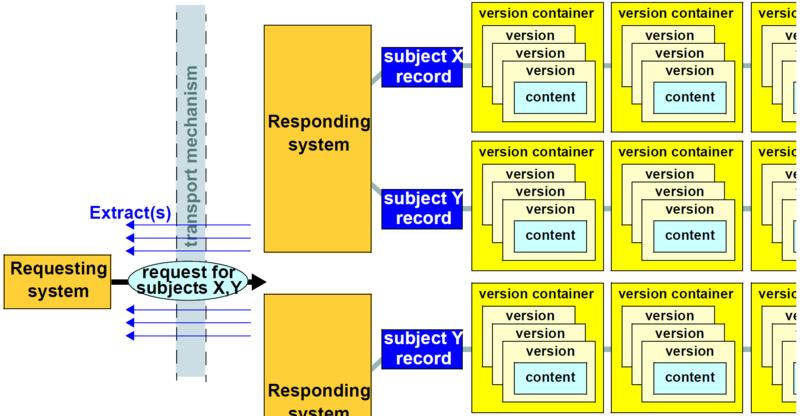 In Figure 1 the lowest level of information shown in a Responding system is simply marked 'content'. 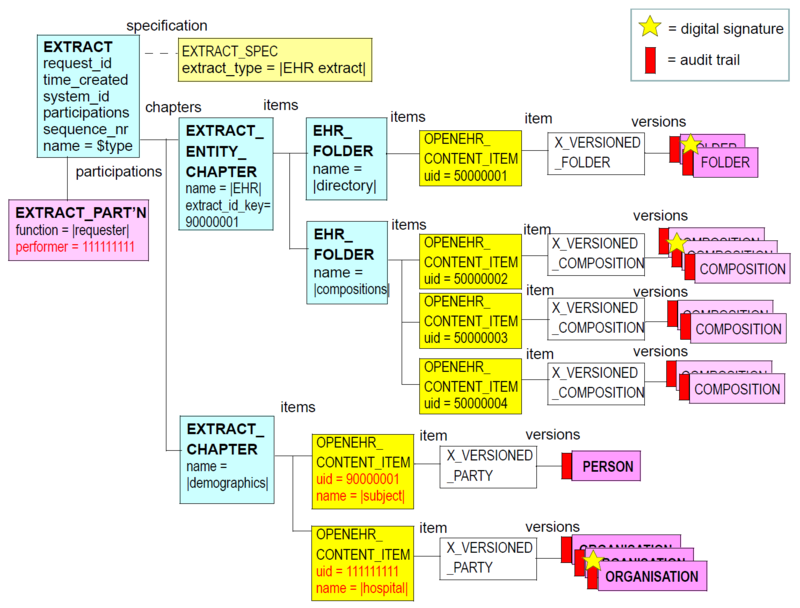 This corresponds to top-level information structures such as Compositions, Folder trees, Parties etc in openEHR. Each such content item potentially contains a whole hierarchy of information items, only some of which is generally of interest to the Requestor. The typical database idea of a "query result" is usually expected to return only such fine-grained pieces. 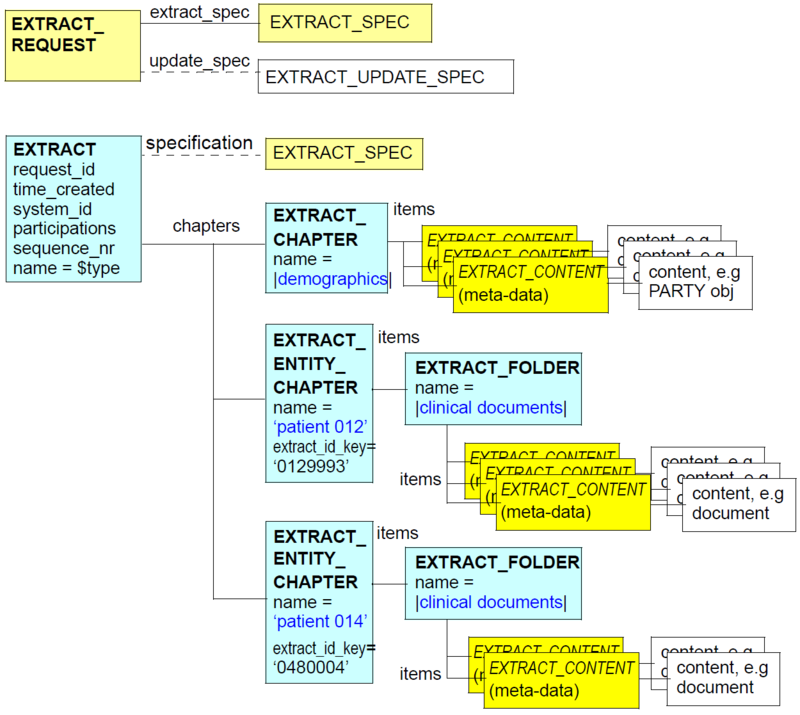 However, the Extract specification here only allows for a granularity of Compositions ('documents' etc), rather than fine-grained query responses which are dealt with by other means. This is because the primary use case of an Extract is to make parts of an EHR available somewhere else, rather than to intelligently query the record in situ and return the result. An Extract request in its simplest form has no version specification, corresponding to the assumption of 'latest available version' for each matched item. However, in some situations there is a need to retrieve previous versions, or information about versions. The version specification part of the Extract request allows this to be done. The possibilities available are as follows. The overall structure of the openEHR EHR for a subject can be replicated with an archetyped Folder structure that creates the groupings of directory, compositions, ehr_access, and ehr_status that are found in an openEHR EHR. 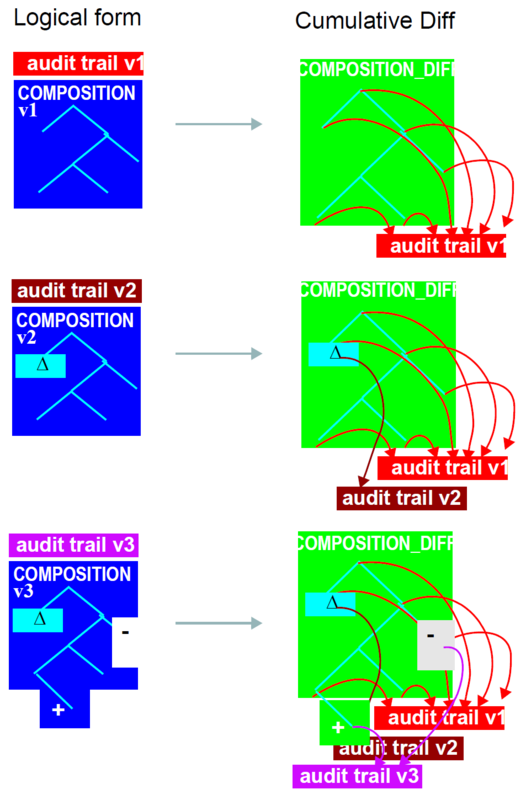 This use of folders is not mandatory, but is likely to be useful in most cases, and is the structure shown in Figure 10 above. Within the content an EHR Extract, wherever PARTICIPATION and PARTY_PROXY structures occur (for the latter, the PARTY_SELF and PARTY_IDENTIFIED descendants), they are preserved intact, for reasons of fidelity. However, the final 'pointer', i.e. the OBJECT_ID.value may be rewritten within the Extract to correctly refer to the intended demographic. A typical S_PARTICIPATION structure is illustrated at the bottom of Figure 10. 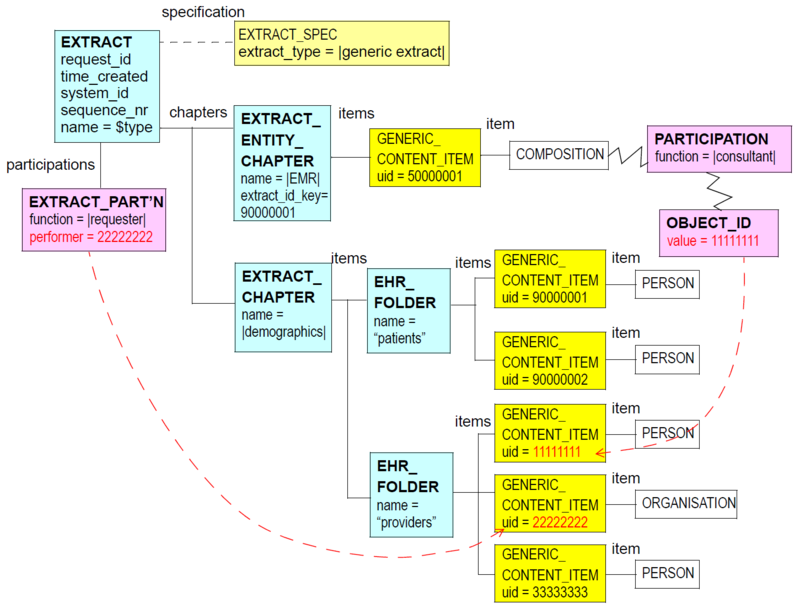 In this figure, the OBJECT_ID.value has been rewritten to refer to the uid (11111111) of the first OPENEHR_CONTENT_ITEM object shown in the figure.